Fo be clear, I do not think that we will save the planet by simply buying “eco” products. I really want to emphasise that point. It’s important that we make mindful purchases and try to borrow or buy second as a priority. This post does contain affiliate links to purchase items but buy local if you can. That said, there are some items that you can’t do without. 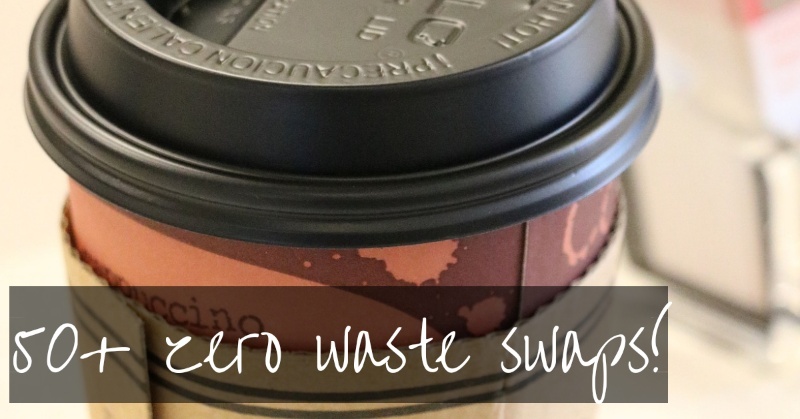 Thankfully there are some amazing zero waste swaps available! 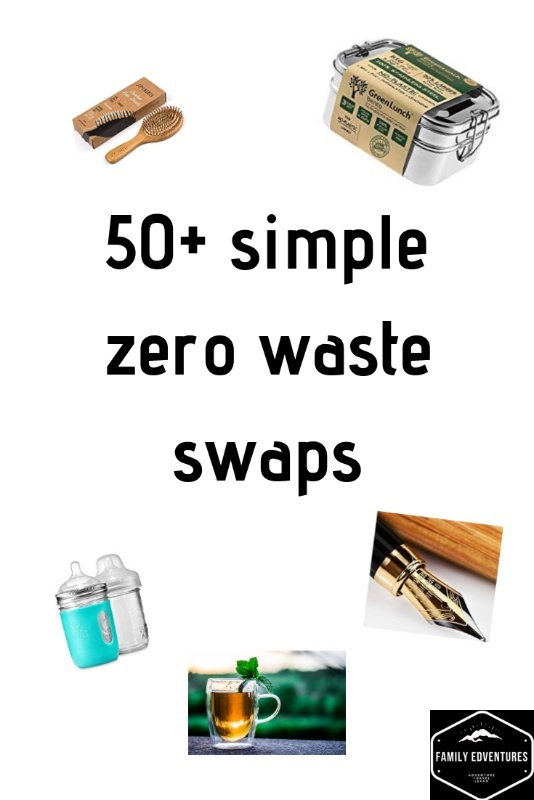 This list includes over 50 zero waste swap ideas so it’s quite long. If you’d like something shorter to start with then take a look at our list of zero waste essentials. Disposable razors are unrecyclable…so they end up in landfill. Reusable razors are awesome. We own this one. My husband and I both use it and it’s great (and I have very sensitive skin). The blades last for ages and are recyclable when it’s finally time for a new one. When your toothbrush is due to be replaced grab yourself some bamboo toothbrushes. They’re biodegradable so won’t join the 3.5 billion toothbrushes that are destined for landfill or the ocean. Children’s ones are available too. Another option that’s greener than a plastic toothbrush is to use an electric toothbrush as only the head need replacing. This one by Source has a handle made from 50% recycled plastic combined with 50% recycled natural fibers. Use reusable face wipes or cut-up small squares of soft jersey fabric instead of using single use wipes or cotton wool pads. The average woman uses over 11,000 tampons over her lifetime! If you prefer pads then you might be surprised to learn that the plastic sticky part is made from LDPE which had the largest impact on global warming. It’s used in tampon applicators too. A year’s worth of a typical feminine hygiene product leaves a carbon footprint of 5.3 kg CO2 equivalent. Reusable sanitary products are the best thing I’ve discovered on this list so far! They’re not expensive and if you like it then you’ve saved yourself a small fortune and the earth a lot of waste! These leak proof pants and pads are brilliant too. Ditch the liquid shampoo and use a solid shampoo bar instead. They smell great and last ages! There are kids versions too. These are perfect for travelling too as there’s no risk of leakages and they can go in your hand luggage. If it looks a little greasy then I’ll add a bit if cornflour to my roots and I look presentable again! You can use arrowroot powder too. Grab a make-up brush and apply to the greasy sections. If you have darker hair then add half cocoa powder to half cornstarch or arrowroot. Darken with cocoa powder if you need to. Mix 2 tbsp Apple Cider Vinegar with 1 cup of water. Experiment with the amount of ACV (up to 4 tbsp) The dryer your hair the less you should need. Wash hair as usual. Tip ACV rinse (avoid your eye!) Rinse. Not only will your hair look awesome and be less tangly but you’ll also save on plastic packaging and unnecessary chemicals. 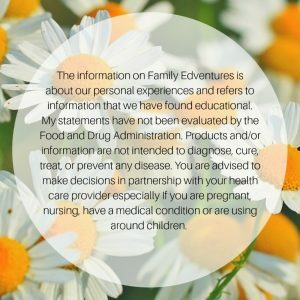 I have very dry skin and have been prescribed cream for eczema by my doctor since childhood. I tend to get through a lot (a big bottle each week), especially during winter-time. I absolutely hate the waste it produces. I went to a class and learnt how to make my own and now need to commit to doing it regularly! If you’ve been using hand wash in a plastic bottle then consider switching back to good old-fashioned bars of soap. Did you know that you can get a bar of deodorant!? These are brilliant for backpacks and sports bags too! Sadly the remnants of these are often found laying on the beach. If you really can’t do without then you can buy the ones below which are 100% biodegradable. Bidets are the norm in so many cultures but being from the UK I’d never even considered an alternative to toilet roll. These bidets have amazing reviews (click the image to read them). Apparently they’re easy enough to fit yourself. treehugger.com reports that making just one toilet roll uses 37 gallons of water. In comparison an average bidet uses only 1/8th of a gallon per use! To produce that single toilet roll it’s also taken 1.3 kilowatt/hours (KWh) of electricity and around 1.5 pounds of wood! We’ll definitely be looking into installing a bidet in our house in Wales. If a bidet isn’t for you the look for toilet roll wrapped in paper or support a company like Who Gives A Crap who produce toilet roll from 100% recycled products and uses no plastic packaging. Ok, this one I’ve never tried. I have terribly weak teeth and admit that I’m too afraid to stop using my usual toothpaste. I am however going to attempt oil pulling instead of mouthwash so I’ll let you know how it goes! Most of the dental floss you buy in the supermarket is coated in PFC. That’s pretty disgusting when you realise that it’s the same stuff that Teflon pans are covered in! Not sure I want to clean my teeth with that! Try one like this instead. These hair brushes are 100% biodegradable! They also offer a money back guarantee if you’re worried you won’t like it. As with all my other suggestions, there’s no point chucking out your old plastic brush to buy this but if you’re looking for a new one get this! 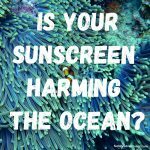 Diffuse natural essential oils rather than using a chemical spray. Take a look at our plastic free diffuser guide. You can recycle toothpaste tubes through terracycle so check our their website here. When your toilet brush is due for renewal buy a biodegradable brush instead. I’m not a huge fan of plastic near food, especially when it’s cooking. We do own a set of muffin liners but more often I just bake cake type cookies directly on a tray rather than in little moulds. Baking means that we can still enjoy treats without creating loads of waste. I make loads at once and freeze them. We don’t use a water filter but if you do then take a look at charcoal filters. I’ve heard good things about them. This is how they work. If you’re civilised napkin users then get some cloth ones or hem some squares of spare fabric. Instead of grabbing for the roll of paper towel get some reusable super-absorbent towels to soak up kitchen spills. These washing up brushes are compostable so they won’t be sent to landfill once they’ve done their job. A metal scourer is also handy for scrubbing pots and pans. Did you know that loads of tea bags contain plastic and and shouldn’t be composted!? Get yourself a tea strainer! While travelling in Europe I’ve noticed that tea bags are often wrapped individually in paper and plastic! A tea strainer means that you can buy loose tea leaves or make your own blend. I love tilleul and hibiscus! Check out our zero waste tea guide. Swap the cling film and foil for food wraps. These are made from all organic ingredients. They are so clever. You literally use the heat of your hands to shape it over the food you’d covering and within seconds it will cool and form a seal. If you need to purchase straws for any reason then take a look at stainless steel ones. If you’re a gardener or pickup a lot of cheap fruits and veg then don’t let it go off. Turn it into puree or fruit leathers or freeze it for smoothie and pies! Replace your disposable coffee filters with the hemp ones. The words ‘zero-waste’ and ‘shopping’ kind of seem like polar opposites but it is possible to shop while feeling the zero-waste vibe! full 10 steps to zero waste for lots more shopping advice. 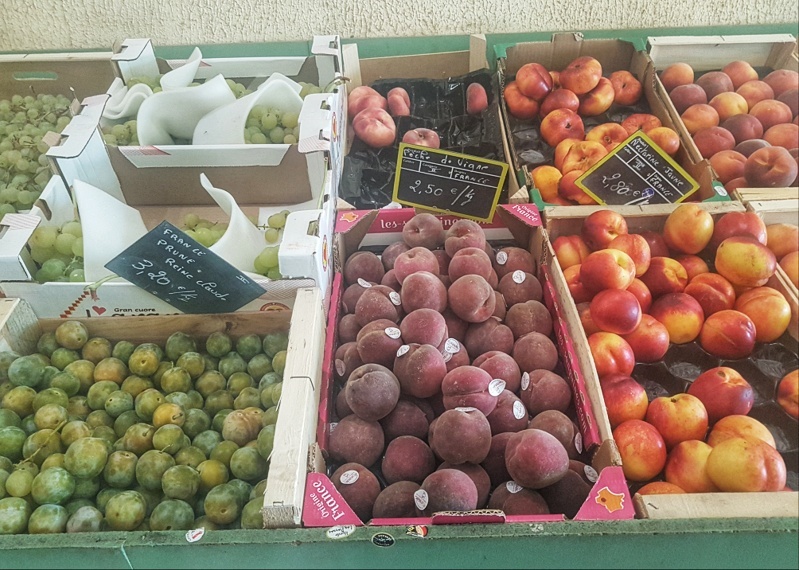 Shopping at our local grocers while in France. How many items of clothing do you own that you actually wear? I know that I tend to rotate the same outfits over and over while the majority of my wardrobe sits untouched. The items that I’d kept for years ‘just incase’ went to the charity shop or the clothes bank before we set off travelling. You don’t have to declutter when go waste free but it can really help to focus your mind on what’s important. When you need new clothes have a look in charity shops…they are amazing places to buy clothes, shoes, toys…anything really. I was hooked around 10 years ago when I found a jumper I’d just paid £80 hanging up with a £6 sticker attached! Bring your own bags. Whether they are cotton jutes or individual produce bags. Don’t buy more than you actually need as making them takes lot of energy and resources. If you don’t already own 216 cotton jute bags that you’ve acquired from every event you’ve ever been too then these look great (it holds 10 bags so is enough for a family shop). I’m not loving the fact that these are plastic but they look like what we need to replace our current cardboard egg box when it wears out. Please tell me if you know where we can find a non-plastic version!? While in France we’ve really got into the habit of bringing our basket to the shops. It’s not something you often see in the UK but here it’s the norm. Who doesn’t have jars lying around right!? Pop a few in your basket so that you have somewhere to place any delicate or small items like soft fruits in while shopping. Any attempts to be waste free are doubly difficult the second you step outside your front door. If you pack food from home then you have a lot more control over how much waste your meal produces. We almost always manage to chuck a few sandwiches and pieces of fruit into a bag or box before heading out the door. Bags like this are great too. 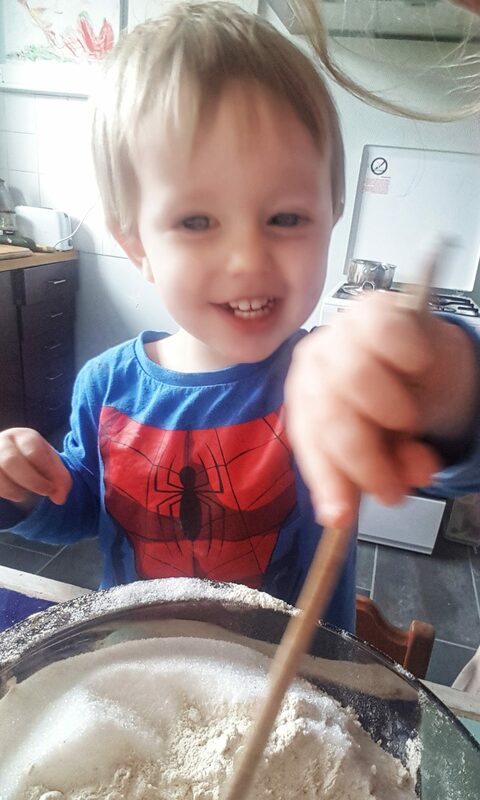 Think he likes his soup! Our stainless steel drinks bottle keeps things hot or cold do it’s really useful. These food boxes are perfect for carrying lunches but they’re also great for keeping in your backpack incase you fancy any take away food while out and about. It doesn’t take long to get used to asking for your zero waste takeaways! 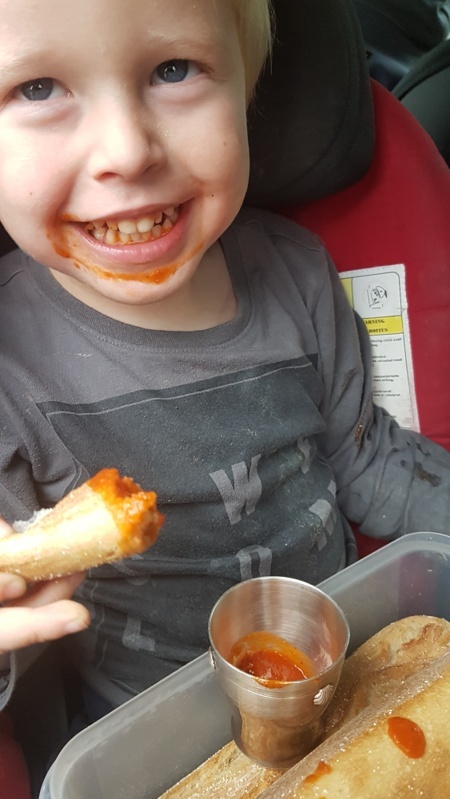 I once ordered a pastry each for the kids and by the time I’d looked down to get my wallet they’d been placed in a polystyrene tub each with six paper bags underneath ‘because they were hot’ and a handful of napkins. Never again! If you pick up a coffee on your way to work or buy one at a stall in the park then it’s really worth getting a reusable cup and getting into the habit of refusing a disposable cup and a stirrer. My stainless steel bottle is one of my favourite zero waste swaps. Drinking from a plastic bottle doesn’t taste great but these steel ones stay cool even in 35° heat. We also use ours for warm soup when we take picnics out and about. and get some approved clear bags for your toiletries instead of using single use bags. I’ve been lucky enough to hear the amazing Bandi from congocalling.com talk at a conference and since then his words have stuck with me. He talked about conflict minerals and why they are a huge issue in the mobile phone industry. How children as young as 7 are mining cobalt in dangerous conditions so that we can replace our phone as soon as a new one comes out. Buy a fairphone which is ethically made, built to last and easy to repair as it has replaceable modules. I probably have enough biros to last me a lifetime but if you hand-write a lot a re-fillable fountain pen is a great way of avoiding all of those plastic biro tubes. If you have old biros or plastic pens in the house then find out if you have a place nearby that collects them for recycling. In the UK look at the terracycle map. Something that’s really easy to do is to add a note to your post box stating that you do not want advertisements or newsletter left. It’s amazing how much of your mail is actually “junk” that goes straight in the bin. On the subject of mail…save envelopes and reuse them! This one will make you very unpopular with some people! Unbelievably people feel very attached to a tradition that means 33 million trees will be turned into paper to make the 1 billion cards needed this Christmas! Yes I said 33 million trees…just for one Christmas. Pick up the phone, share a video on social media, donate to charity, write “Merry Christmas” on a tangerine…just don’t give a card to someone who will put it straight in the bin. The amazing thing us that a lot of people only give cards because they receive them so if you stop they stop returning them! While I’m sounding like a total humbug I may as well go all out! Stop with the foil and un-recyclable wrapping paper! Use brown paper that’s recyclable or better still newspapers, magazines or fabric squares and sacks (that you can reuse every year). A part of me wants to tell you to buy everything locally and to never shop with the massive online stores but the reality is that some of us just don’t live in places with amazing facilities at the next tram stop. Sometimes we’re better to order a years supply of bamboo toothbrushes and wax food wraps online than to continue buying plastic toothbrushes and cling film every month. When you order online though make sure you add a “note to seller” asking them to use nom-plastic, recyclable materials if possible. Most will oblige. Try to save items to your basket too so that you can order when you have a few bits you need and ask for them to be delivered together. According to LV a UK baby will cost its parents £11,498 on average! I can tell you know that there is no way our babies combined cost us even 10% of that figure. In our experience babies need little more than love and nourishment. Here are some zero waste swaps for babies and children that will also save you money. Reusable nappies are so easy to us nowadays. We use pocket ones like this as they just pop on and fit from newborn to potty training! Ours are still going strong after two boys. I know it’s pretty controversial to talk about such things with other parents but hey ho! You can literally use an entire pack to wipe one ice cream hand. We had a slight baby wipes relapse after Bastien was born but hated seeing how many we were getting through each week. Now we bring cut up cloth squares in a tub. When we need a wipe we just pour on some water from our bottle. The dirt wipes get stored in our nappy pouch until we get home. Breastfeeding is obviously an entirely zero waste baby feeding option (of you use washable breast pads) but if it’s not for you take a look at these teats that fit on top of mason jars! Swap all of those individual pouches and pots for some baby-led weaning or simply mash some of what you’re eating. Stew a load of fruit or vegetables and freeze them in portions in mason jars (see above). I also used muffin tins yo freeze small portions. Babies change size so quickly that they’re clothes are basically brand new when they hit eBay or the charity shops. Buy clothes that will last a while like legging style trousers and stretch t-shirts. Our son is still wearing his jean look leggings at 22 months that we bought him at 6 months old. The label says 6-9 months and he’s a tall baby…but they definitely still fit! With our first son my sister gave us her unused for…it was still unused after our babies. We ended up having a floor bed and co-sleeping baby next to us in the guest single mattress. What worked for us won’t suit everyone so if you want a crib mattress take a look at one that’s a bit more eco and pass it on to a friend or family member when you’re done with it. I’ve mentioned second-hand already but don’t be afraid to give second-hand toys as gifts and donate any your kids don’t use to a charity shop, local play group or friends. I’m sure I’ve missed some ideas so please let me know if you have any others! Zero waste living isn’t about being perfect and getting it right all of the time. It’s about trying to make the best decisions we can at any given time without making life crazy difficult for ourselves! Feel good about the waste free swaps you are making rather than feeling bad about the ones that you’re not! Should we have a zero waste jar? Plastic Free Shopping | read this guide! 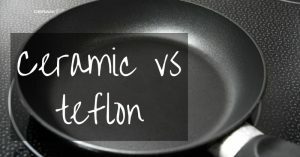 Ceramic Pans vs Teflon – which is better? How To Be Self Sufficient | tips for being self sufficient in 2019! Playgrounds Near Me? | Stop Googling and do this instead! How to make apple cider vinegar drink that’s actually drinkable! Natural Floor Cleaners – find the best for your floor!